This sonorous trail, with a total length of 6,5 km, comprises of 19 stations which invite the hiker to stop and make music, to listen to nature, or to just admire. The trail starts at the parking at the town hall in Hoscheid. Guided tour not available in English. Not suitable for strollers. 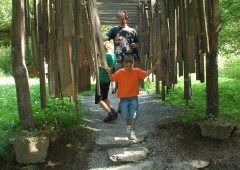 The trail is recommended for children from 7 years on. Reservation requests must be made ​​at least 2 working days before the visit.